Welcome to the 16th episode of Kidmin Talk, the webcast show hosted by Karl Bastian, the Kidologist. Listen here on Kidology or subscribe via iTunes to listen on-the-go with your iPhone, iPod, iPad, or other mobile device. SPONSOR: This episode is sponsored by I BLEW IT by Brian Dollar. Laugh at yourself and Learn from your mistakes! Brian Dollar grew up as a "church brat." God radically saved him and called him to Kids Ministry. He has served as a Kids Pastor for 20 years and currently serves a local church in North Little Rock, Arkansas. Under his leadership, the children's ministry of First NLR has grown from an average weekly attendance of 200 to an average attendance of over 600 children with a volunteer staff of over 150. Brian is the founder of High Voltage Kids Ministry Resources and produces curriculum and media resources that have been used in over 5,000 churches worldwide. Brian has grown to become one of the most respected Kids' Pastors in the country, but few people know the path he's taken to learn his most important lessons. In this book, he opens his heart and his life to share his biggest failures. Some of the principles are about ministry philosophy, strategy and communication, but the most important ones - the lessons that will make you laugh and melt your heart - are about the deeper qualities of fear and hope, pride and humility. As you read this book, trust God to change you from the inside out. 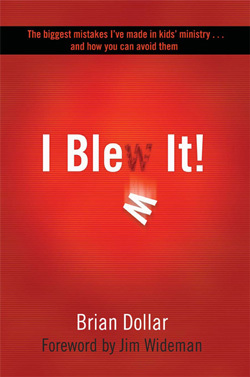 What the Kidologist wrote about I Blew It! . . .
"Reading Brian Dollar's book was such an encouraging relief. I laughed out loud at his stories as I remembered many times I blew it, too. And I enjoyed reading the insights he has gained over the years as God has refined his youthful enthusiasm into seasoned wisdom. This book is a terrific resource for beginners in kidmin and should be a textbook for veterans who may think they "know it all." Brian has practical guidance for all of us who minister to children or lead those who do." WIN A COPY of Brian's book by SHARING YOUR STORY of when YOU "Blew It" in the forum, and Kidology will pick two listener's stories to win a free copy of the book! KIDMIN WINNER! Our winner this week is Tom Bump who guessed "Laughter." Commander Bill was close with "LOL," better luck next time, friend! (LOL) They each win a FREE CD collection of awesome kids worship music from Uncharted Waters I will dropping in the mail! WANT TO BE A WINNER? Submit your guess or suggestion for next week's Kidmin Talk Key Word for the letter "M" - by E-mail, Forum, or Twitter.